List price $105. Take these symbols with you for strength and stability. It comes with an adjustable bracelet (bs418), ch909 ganesh bodhi leaf (1.5 cm), ch380 labyrinth charm (1.5 cm), ch775 root chakra charm (1.2 cm) and ch372 yin yang charm (1.4 cm). Ganesh is the Hindu elephant who bestows knowledge and removes obstacles. A labyrinth is a path for meditation. The root chakra stands for stability and strength. Yin Yang is a symbol for balance. Each charm has a spring clasp to easily take on an off. The charms can be worn all together, individually or in any combination. Coexistence charm bracelet with symbols and love, peace and spirituality/religion. 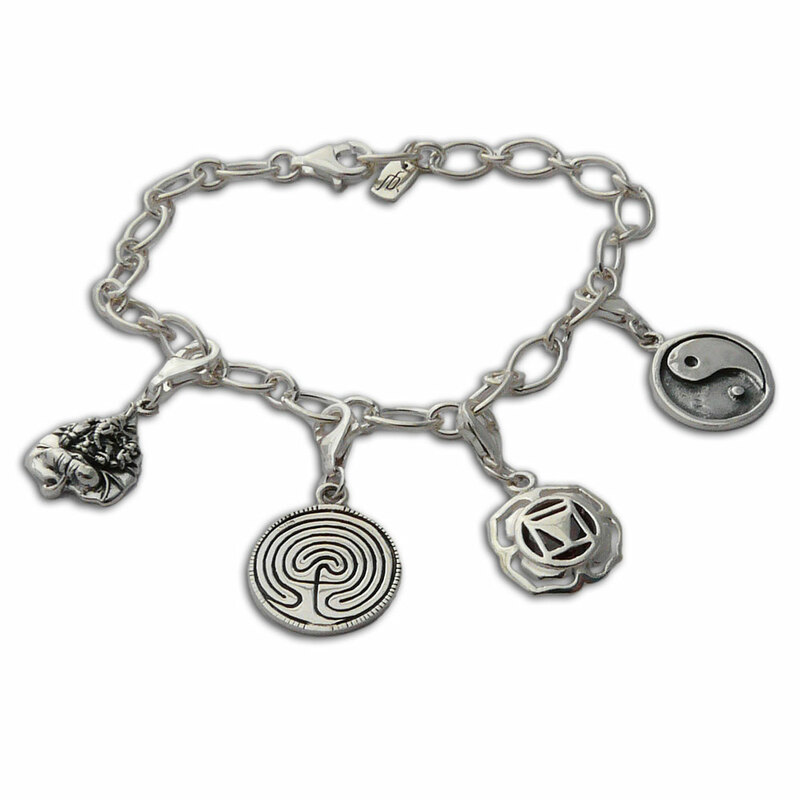 Get blissed out with the sacred Hindu symbols charm bracelet. Bodhi tree pendant hangs from a rubber necklace. The clasp says "shanti" meaning peace . It is crafted out of recycled brass. This is an ideal necklace for men or women. Sturdy, beautiful, eco and fair trade! 18"/45 cm necklace, 3 cm pendant, 12 g.